RealmContent coupled with the Realm Mobile Platform quickly gives the developers the ability to add new content into an iOS App by adding data directly into the Realm Browser app. 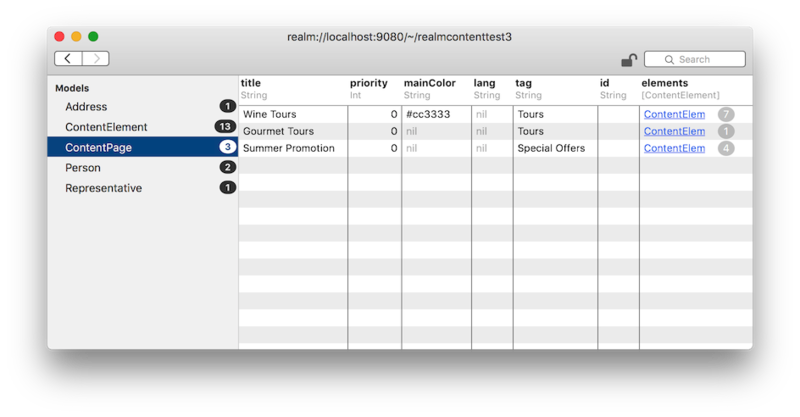 RealmContent automatically adds the Realm objects it needs into the app’s own schema and allows the developer to use a number of pre-configured View Controllers to list the available content and to render each of the content “pages”. The component works mostly automatically while it allows for a lot of customization. It saves developers time and drudgery of implementing the underlying plumbing themselves or even having to roll out a completely new version of the app to change in-app content. The library is the easiest and fastest way to push content in real-time to your complete user base. There are five easy steps to add a dynamic content management system to an iOS app. Your app would normally have a list of objects it syncs from the Realm Object Server. Once you import RealmContent it will expose two new models which Realm will add to your default schema: ContentPage and ContentElement. If you’re using multiple Realm files, add ContentPage and ContentElement to the desired object schema. Use .plain for a plain list or .sectionsByTag for a list with sections having the pages split by their tag property. 4) Implement your table view or collection view data source methods like usual, but fetch data from the content data source. The class offers few methods to do that like: numberOfSections, numberOfItemsIn(section:), titleForSection(section:), and itemAt(indexPath:). Present a ContentViewController instance to display content. You can do this from a table/collection view tap delegate method, prepareForSegue(_:) method, or from an arbitrary piece of code. The presented view controller uses a table view to dynamically show the content from the given ContentPage element. In case you change the content remotely, the changes will be reflected in real-time on screen. You can easily use the Realm Browser app to add or remove new pages, add, re-arrange, and otherwise modify blocks of content, and more. You can even change the accent color of your headings and links. The component is open source and you can find the source code and a demo app here: https://github.com/realm-demos/RealmContent. The quickest way to try RealmContent in your app is via CocoaPods; add pod 'RealmContent' to your Podfile. If you have an idea for a feature, want to report a bug, or would like to help us with feedback reach us on Twitter or create an issue on GitHub. We’re excited to see how far are you going to push this component and the awesome dynamic apps you’re going to create with it!